Winning cures all. Had Dundee United stolen a point from Friday night’s game in the dying minutes then the attitude towards Jason Cummings from within the Easter Road dressing room might have been a little bit different. The striker netted the game’s only goal, but contributed to some late pressure when he was sent off for two quick yellow cards, the latter of which saw him palm the ball into the net with his hand. But United didn’t manage to break through, and Cummings’ first half finish proved to be the difference. 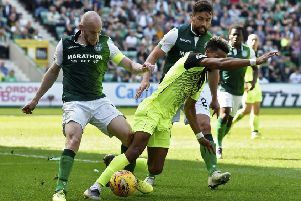 Afterwards manager Neil Lennon was in a forgiving mood, calling the handball “stupid” but refusing to be too harsh on his over-exuberant player, while Cummings’ team-mates saw the funny side of the incident. After Cummings tweeted that he was “grateful” for the lads securing the three points, Marvin Bartley responded with an image of Diego Maradona’s famous Hand of God goal against England, but with Cummings’ face in place of El Diego’s. Along with the tweet he wrote “didn’t even look like handball to me lad”. John McGinn joined in on the fun. The midfielder put a photo of Cummings in mid-air, hand extended out in front, with the caption: “hands up if you love the weekend”.